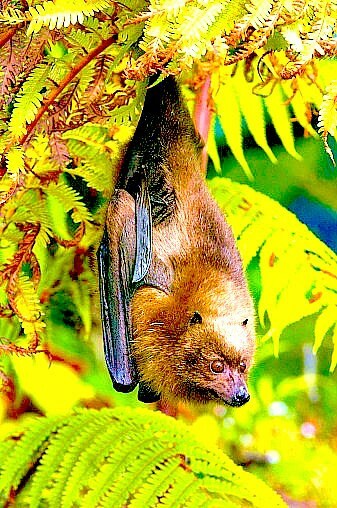 The Rodrigues flying fox gained its name because of its fox-like large pointed ears, elongated snout and large eyes. Despite these features, this species is a bat, and is grouped under the order of mammals known as the Chiroptera, which in Greek means 'hand-wing'. Of the mammals in Chiroptera about one sixth, including this species, belong to the sub-order Megachiroptera which, as mega implies, defines the larger bat species. The Rodrigues flying fox's body is fairly small but its wingspan can be up to 90 cm, with lightweight bones in the wings, facilitating flight. Two thin layers of skin are stretched between these finger-like bones, to make the bat's wing. This skin can amazingly stretch as much as three or four times the length of the bat's body giving it its huge wing span and is so thin that the wings are almost see through. Most flying fox species are brown but the Rodrigues flying fox is brightly coloured, and may be yellow, orange and red or silver and black. Males and females are similar in appearance, with the offspring also looking like the adults.